Making this delicious Tiramisu Berry Cake is a great way to use your fresh summer berries. I’m a big fan of tiramisu and it inspired me to used its flavors as a base for the berries that I picked on my morning walk. Mascarpone, vanilla, espresso and amaretto form the base flavors of the cake, giving the main role to the fresh-tasting berries on top. August is a month filled with celebrations in our family. Besides a continuous line of birthdays my husband and I celebrate our wedding anniversary at the end of the month. For me this means lot of opportunities for baking and trying out new things. This no-bake cake is quick to prepare. Technically all the tools you need are some bowls, a spring form pan (or dessert bowls if you’d like to make several small desserts), a mixer and an espresso maker. The cake is doable in summer cottage environment and that was an important criteria for developing the recipe. 120 gr savoiardi cookies (aka. ladyfingers) – For the gluten-free version: use gluten-free savioardi, available in most grocery stores. Put the gelatin leaves in a bowl of cold water. Cover the base of the spring form pan with ladyfingers. Mix one shot of amaretto with the espresso and pour on top of the ladyfingers. In a bowl, whisk the vanilla sauce until it gets fluffy (I used this vanilla sauce). Whisk in the mascarpone and one shot of amaretto. Heat up a spoonful of water. Drain the gelatin leaves by squeezing them in your hands before stirring them into the drop of water. Whisk the liquid gelatin into the mascarpone -vanilla sauce and pour the whole thing on top of the base of the cake. 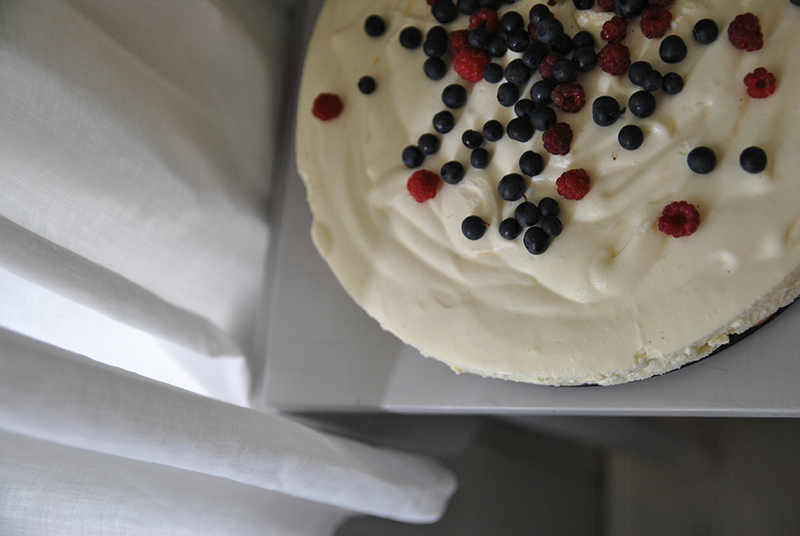 Put the cake in the fridge for a couple of hours and decorate with fresh berries before serving.